Bertus has an affinity with Pinotage and is probably best known for the popular ‘coffee and chocolate’ interpretation that he pioneered when working at Diemersfontein, and KWV’s award winning ‘Café Culture’ mocha Pinotage released in September 2007. It has been decided that the best barrels produced by this experimental boutique winery will be bottled separately and made available to the public under a new Mentor’s Selection label. The first vintage will be the 2006 Pinotage, and although the price has not been finalised, it will be at what KWV call ‘the top end of the ultra-premium prince point’ , in other words it is likely to cost much more than most other South African wines. I tasted samples from two barrels of the 2007 vintage. These are works in progress and a long way from being ready, but the first was very exciting: smooth, lots of complex layers, good balance of subtle wooding and acids. 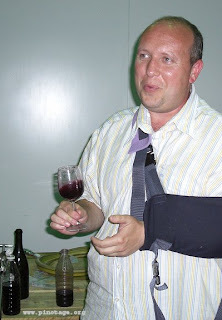 “I want to emphasise the Pinot Noir characteristics,” says Bertus. I’m using 228 litre Latour Burgundy barrels. The second sample had brighter fruit and more forward acids, but didn’t seem as together as the first. Then I tasted the 2006 Pinotage, which is now in bottle. This had spent 18 months in oak. It had good fruit, but the acids seemed a bit aggressive and wood tannins were strong on the finish. “We are not making a wine that should be drunk on release,” Bertus told me. “People who buy this will need to understand that it is a wine that needs to be cellared for a few years, at least, before it is ready to drink.” By now the bottle had been opened a short while, so I poured another measure and also gave a vigorous swirl to aerate it. On second taste it was less aggressive and, now with the explanation that it was a wine for the long haul, not immediate gratification, I could see the underlying potential. 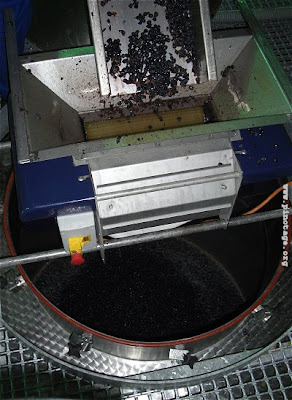 The wine is currently undergoing bottle maturation and is likely be released after another six months ageing. I was impressed by KWV’s commitment to taking Pinotage to the highest levels, by hiring Pinotage expert Bertus Fourie and using labour intensive small scale winemaking. 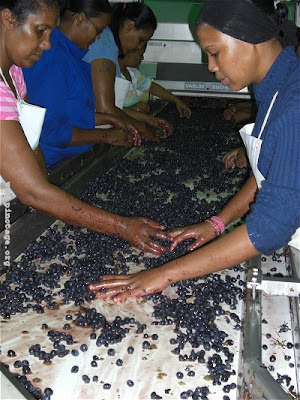 Was I seeing the birth of South Africa’s equivalent to Australia’s iconic Penfolds’ ‘Grange’? Only time will tell, but an ultra-premium priced Pinotage can only enhance the overall status of the variety.